Probably of little use to enterprise developers of digital signage but great for those that target the SMB sector. Adobe Press release reads …..
LOS ANGELES, Calif. – October 25, 2010 – At Adobe MAX, Adobe’s worldwide developer conference, Adobe Systems Incorporated (Nasdaq: ADBE) today announced Adobe® AIR® 2.5 software for televisions, tablets, smartphones and desktop operating systems. A key element of the Adobe Flash® Platform, AIR enables developers to leverage existing code to create and deliver standalone applications across devices and platforms. Adobe AIR now supports smartphones and tablets based on Android™, iOS, BlackBerry® Tablet OS, and desktops including Windows®, Macintosh and Linux® operating systems. In addition, Samsung will be the first television manufacturer to ship Adobe AIR in its line of Samsung SmartTV devices while Acer, HTC, Motorola, RIM, Samsung and others are expected to ship the runtime pre-installed on a variety of devices including tablets and smartphones later this year and early 2011. With Adobe AIR, developers are able to use familiar tools including Adobe Flash® Professional CS5, Adobe Flash Builder™ and Flex to build rich standalone applications. Hundreds of them are already available on Android Market and Apple’s App Store today. In addition to AIR 2.5, Adobe unveiled Adobe InMarket™ today, a new service that allows developers to easily distribute and sell their applications on app stores across different device types from Acer, Intel, and others. Adobe InMarket operates seamlessly in the background and allows end users to download applications directly from the storefront. For more information about Adobe InMarket visit www.adobe.com/go/inmarket. “With the release of AIR 2.5 more than three million Flash developers can now build a single game or application and easily deploy it across multiple application stores and devices,” said David Wadhwani, senior vice president, Creative and Interactive Solutions Business at Adobe. “This is a huge step forward for developers looking to build rich, engaging applications but have historically had to incur the cost of building and deploying this content across multiple devices and platforms.” AIR 2.5 enables rich application experiences through a series of new features, including support for accelerometer, camera, video, microphone, multi-touch and gestures. Support for Geo Location allows developers to create location-based applications and services. AIR 2.5 is also able to display native browser controls within the application allowing for the integration of HTML and .SWF content. With SQLite support developers can easily store and cache databases inside an AIR application. In addition, hardware acceleration for Adobe AIR is enabled across all major silicon partners including Broadcom, Intel, nVidia, ST Micro, Trident, Texas Instruments, Qualcomm and others. Already one of the top free apps on Android Market, with more than 50,000 users giving it a 4.5-out-of-5 star rating, Flash Player 10.1 brings rich Flash based content to mobile devices inside the browser. The runtime is now certified on close to a dozen Android devices and will become available on dozens more over the coming weeks and months. Adobe also announced that Flash Player 10.1 was downloaded more than two million times from Android Market. In addition to Android Market, the runtime is distributed directly by device manufacturers and operators via pre-installs and operating system upgrades. With Flash Player 10.1 available on Android and Google TV today, BlackBerry platform, webOS, future versions of Windows® Phone, LiMo, MeeGo,and Symbian OS are also expected to support Flash Player 10.1. 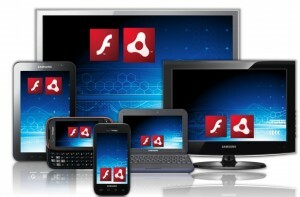 For a list of devices supported today, visit http://www.adobe.com/flashplatform/supported_devices/smartphones.html. Adobe also announced previews of developer tools that make the process of multiscreen development more streamlined. With new releases of Flash Platform tools including an AIR 2.5 software development kit (SDK), developers can build mobile and multiscreen applications for smartphones and tablets, while maximizing design and development productivity. An update to the open source Flex framework provides developers with a common framework for building web, desktop and now mobile applications. Developers can build standalone mobile Flex applications with the same ease and quality as on web and desktop platforms. For details visit http://labs.adobe.com/technologies/flexsdk_hero/. Adobe AIR 2.5 and the Adobe AIR 2.5 SDK for Android and desktop operating systems including Windows, Macintosh and Linux are available today. Users of Android 2.2 “Froyo” devices can download Adobe AIR directly from Android Market today. Adobe AIR 2.5 for BlackBerry Tablet OS and the Samsung Smart TV platform is expected to be available early 2011. A preview release of Flash Builder is available for download. This entry was posted in Uncategorized and tagged Android by Dynamax. Bookmark the permalink.